In the 2010 general election, Alliance for Workers' Liberty supporter Jill Mountford will be standing against New Labour Deputy leader Harriet Harman in the south London seat of Camberwell and Peckham. We have already distributed thousands of leaflets (covering most of the constituency), held estate meetings, contacted union branches and talked to hundreds of people about the case for a working-class voice in politics and for socialism. • For our policies and why we are standing see here. • We are doing stalls, leafleting and canvassing every weekend. 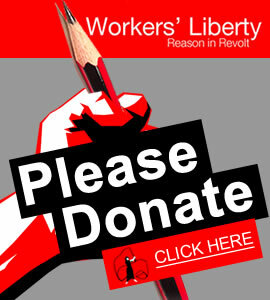 If you'd like to come and help, drop us an email at jill@workersliberty.org or ring 07796 690 874 or 020 7207 0706. • Invite a speaker to your union branch, tenants' association or campaigning group. • Make a donation. If you'd like to do so, get in touch. • We have a Facebook group: Support our socialist candidate in Camberwell and Peckham! • Leaflets and bulletins from the campaign will appear here soon. For articles on the campaign from our newspaper Solidarity see below or here. • Get in touch for more information: jill@workersliberty.org or 07796 690 874 or 020 7207 0706.